With its simple ingredients and quick preparation, Orange Fluff Salad has been a family favorite that goes back decades! 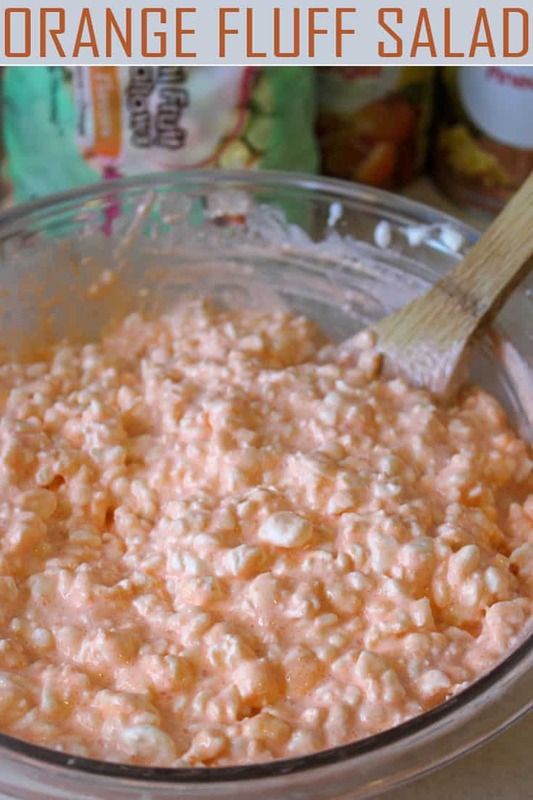 Orange Fluff Salad is the perfect side dish for family get-togethers, backyard BBQs, potluck dinners and even holiday parties. 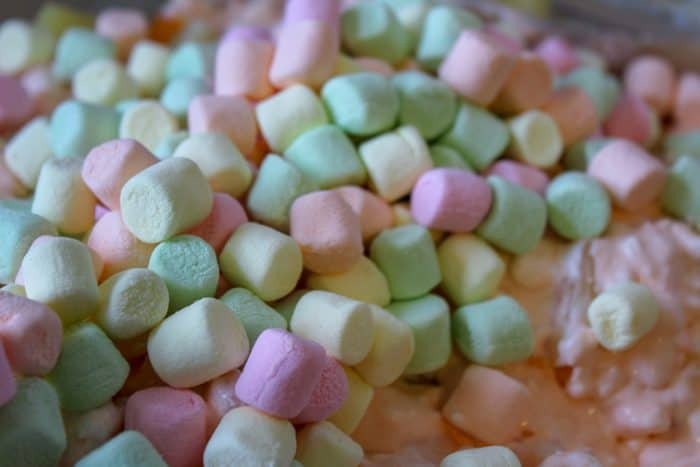 For most, fluff salads were a thing of the past, a retro dessert fondly remembered from their childhood in the 60s, or spotted in a Betty Crocker cookbook. But not anymore! This mid-century food trend has made its return, introducing a whole new generation to its deliciousness. Fluff salads are a delightful mix of fluffy marshmallow and jiggly Jello, bursting with fruity flavors. Once it’s all stirred together, you have the perfect blend of textures and tastes that your friends and family are sure to love. 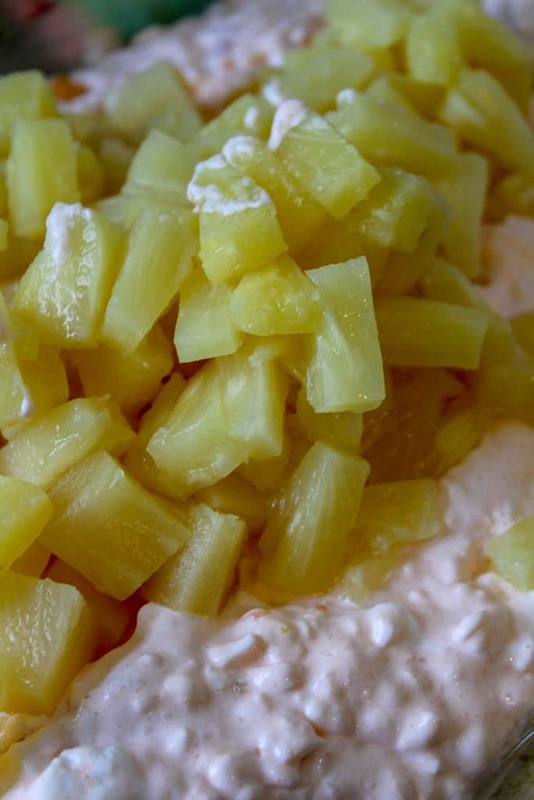 Orange Fluff Salad is often made with canned fruit, like this one, as well as cream cheese. 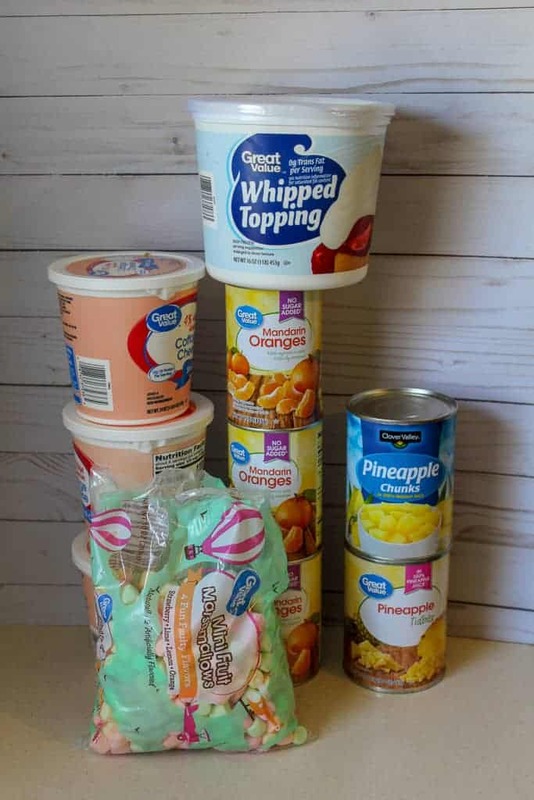 However, you can substitute the cream cheese for cottage cheese, which is what we did to keep this treat a little lighter but still sweet. 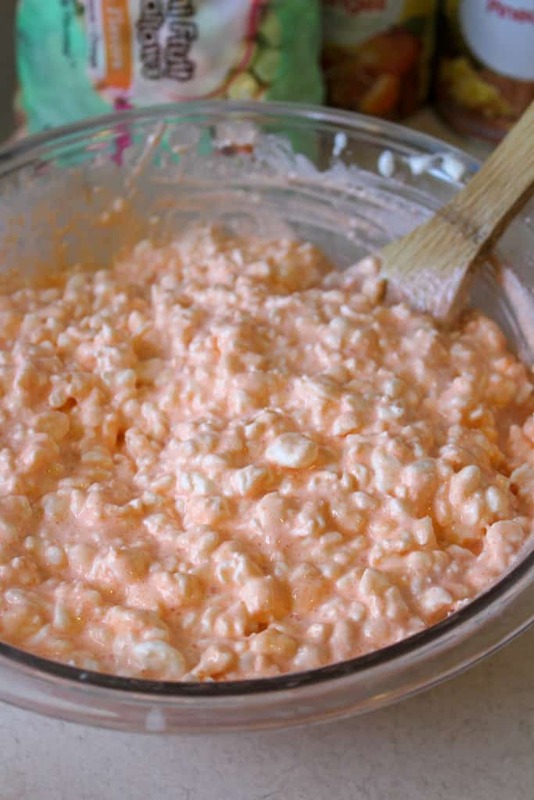 Whether you’re a fan of cottage cheese or not, you won’t be able to resist this yummy Orange Fluff Salad! You can make fluff salad with canned fruit to keep it simple or switch it out for fresh fruit. Fluff salad can be made in a variety of different flavors from lemon to blueberry, or even Oreos! The possibilities are endless, but if you’re new to the world of fluff salad, here’s a great recipe to try. For a low-fat option, use low-fat cottage cheese. The steps to make Orange Fluff Salad are so simple! Step #1: In a large bowl, mix the cottage cheese and the pack of Jello. Step #2: Fold in the whipped topping. You will want to make sure it is frozen or semi-thawed. If you let if fully thaw, then it won’t set up correctly. Step #3: Add your oranges and pineapple. Gently mix. You’ll want to be extra-careful with the oranges — canned mandarin oranges are a bit fragile. Step #4: Last thing to add – the marshmallows. Mix one last time! Step #5: Transfer your fluff from the bowl to a large baking dish. Smooth out the top and cover. Put in the refrigerator and chill for 4+ hours. Looking for more simple potluck recipes? 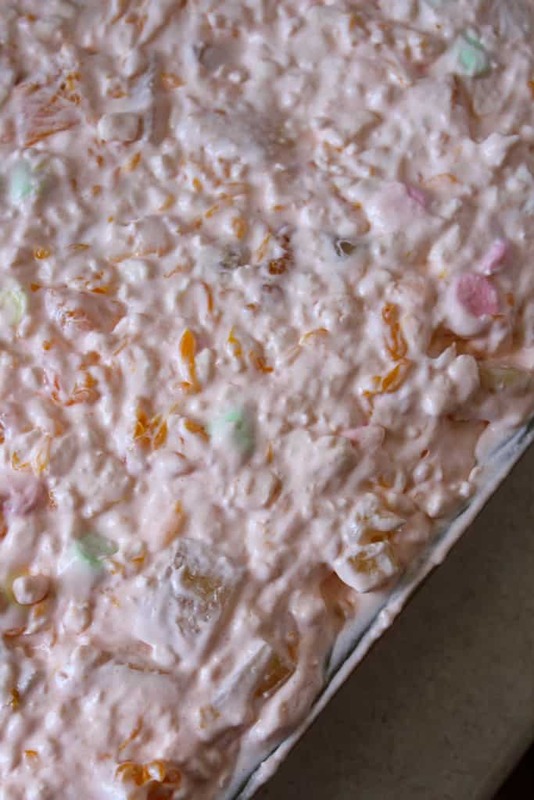 Orange Fluff Salad is a lightful sweet, fluffy and fruity treat. In a really large bowl, mix the cottage cheese and the pack of Jello. Fold in the whipped topping. You will want to make sure that it is frozen or semi-thawed. If you let it fully thaw, then it won’t set up correctly. Add your oranges and pineapple. Gently mix. You want to be careful with the oranges! Last thing to add - the marshmallows. Mix one last time! Transfer your fluff from the bowl to a large baking dish. Smooth out the top and cover. Put in the refrigerator and chill for 4+ hours. This is perfect for taking to picnics or potlucks.